Discover a passion for history…. British Pathe ‘D-Day Landings’ (1944) from classic series ‘A Day That Shook The World’. Uploaded to You Tube 13.4.2014. When the Allied forces landed in Normandy, France on 6th June, 1944, it marked the beginning of the end of World War Two. D-Day (codename OVERLORD) was one of the greatest amphibious assaults of modern history and Hampshire was the nerve centre of military operations. Large numbers of troops embarked from ports along Hampshire’s coastline and the county’s various industries were crucial to the invasion’s successful outcome. Hampshire was important because of its robust travel infrastructure which consisted of a comprehensive network of railways, established Sea Ports and developed industries. It was the perfect strategic location to centre a majority of the Country’s preparations for D-Day. Without access to all of these facilities, available within easy reach of the coast, the choice of Normandy as a location for the invasion of Europe would not have been possible. This article tells Hampshire’s unique D-Day story, in the words of those who experienced it first-hand. Once the county’s best-kept secret it can now be re-told. These individuals made a vital contribution towards changing the course of world history forever and their stories must never be forgotten. ©Come Step Back In Time. Exhibit from the D-Day Museum, Portsmouth, Hampshire. Preparations had begun in Hampshire several years before 1944. An extensive network of tunnels were excavated by Welsh and Belgian miners of the Pioneer Corps underneath Fort Southwick, Portsdown Hill near Portsmouth. Completed in 1942, the UGHQ at Fort Southwick became known as Portsmouth Naval Headquarters and had been fitted with all the latest telecommunications equipment. There were no lifts down to the tunnels. Staff had to negotiate, perhaps two or three times a day, the ‘dreaded steps’ to UGHQ, all one hundred and seventy-nine of them, if you used the eastern entrances. Naval Commander-in-Chief of the Allied Naval Expeditionary Force, Admiral Sir Bertram Home Ramsay (1883-1945), coordinated Operation Overlord’s naval plans (codename NEPTUNE) at Fort Southwick from his office in nearby Southwick House. Southwick House, or Southwick Park as it was known back then, was HQ for the Supreme Headquarters Allied Expeditionary Force (SHAEF). You could see all the ships beginning to line-up [for D-Day], and all these lanes [around Portsmouth] were full-up with tanks and people and men sleeping everywhere…they were coming in as a blessed battalion and they were all sleeping under tents and on the side of the road, wherever they could get. And then, all of a sudden, they were gone. Special passes were issued to enable our entry to the “Underworld” which lay below many, many steps…The Plotting Room had several cameras located at strategic points around the Plotting Table in order to record the sequence of the plots. On one wall was a gigantic map which was used for plotting aircraft. There were two balconies, one for the Controller and Officers in charge and one at a higher level for the Teller and the Commander and his staff, who often put in an appearance, especially when allied shipping was being attacked. After a few days I was fortunate to be offered the job as “Teller”. I loved it! I had direct telephone contact with “Sugar King” [The HQ for General Eisenhower] and also the Admiralty where Mr Churchill was located. It was all so top secret, that small wonder I had been taken to “Sugar King” in a car which had all the windows completely blacked out. The invasion force was plotted twice. On the first occasion, inclement weather prevented the force from proceeding but on the second attempt the multitude of ships set forth and the Plotting Table was saturated with the massive number of vessels which were taking part in the invasion of Normandy. At the end of this shift I had lost my voice. However, when the Commander complimented me on my work I was able to glow with pride…Plotting work continued until July 1944 and then we were posted to the radar station in Dunkirk, Kent. On D-Day I must have been in a shelter because I remember being in a strange place when we were woken-up about 1.30am and told to report as quickly as possible. We couldn’t understand what the urgency was about when we went on duty but as time went on we couldn’t believe what was happening. The plotting table was saturated with ships of all sizes. The Wrens working behind us became very excited as the names of the ships were registered. They seemed to know someone on lots of the ships. It must have been a worrying time for them as we gradually realised what was happening. We worked extremely long hours with short breaks. We didn’t feel tired at the time and certainly didn’t want to leave the plotting table. At the end of our stay we all received a letter of thanks from the Commander-in-Chief. There were large rooms with Plotting tables, and small tunnel-shaped rooms equipped with Teleprinters and Switchboards. Offices with desks and filing cabinets; a Galley and Wardroom, Dormitories and Wash-rooms….Early in the morning of 6th June, our waiting was ended. Officers of the three Services were standing around in groups and the strain showed on their faces. I had been on duty for 48 hours, with just short naps. and felt very tired. Suddenly, one of my young Wrens shouted, “Maam, Maam, something is coming through”. The red light on the panel glowed brightly….I rushed to the position and listened. There it was – the long-awaited code word which meant so much. They were through at last. A cheer went-up and many young girls shed a tear. Maybe, a boyfriend was over there – it was a very emotional moment – one which I shall never forget. We used to live down there for twenty-four hours when we were, sort of, on shift. You got time-off, obviously, and you’d get a couple of days off, but we used to sleep down there…. Then, one day, someone discovered we had nits! … But you don’t wonder when you are [down there] twenty-four hours, [sharing the] same blankets and bedding. Goodness knows what was down there…. We had to go for ultra-violet treatment, because they thought that [living] underground was not all that good for all these girls… [We got] undressed and sat in front of a big lamp. No suntan…The things you could get down there, if you weren’t careful, were verrucas, and I think possibly that was caused by the coin matting…We had to ask what the day was like outside [when we were working down in the tunnels]. I never went into the Plotting Rooms. We were very busy because we were connected-up to Southwick House. Well we had lines to everywhere. We had all the Air Force bombing places, and everywhere you could think of…All calls were scrambled…We had Post-Office engineers there twenty-four hours… There were also WRNS, WAAF Army Officers, Sergeants. Each Officer looked after two or three girls. ‘Eisenhower in Britain’ (1944). British Pathe film. Published on You Tube 13.4.2014. ©Come Step Back In Time. Southwick House (Southwick Park), Fareham, Hampshire. Defence School of Policing and Guarding (DSPG). In contrast to the difficult working conditions at Fort Southwick, SHAEF HQ at Southwick Park was a far more pleasant location with its spacious grounds, lake and dense wooded areas (deforested in the 1970s). The house itself became the nerve centre of Operation Overlord. On the ground floor were offices of the Naval Staff Officers, Operation, Navigation, Landing Craft and Weather personnel together with their respective personal assistants. Also located on this floor was the famous Map Room. Col(Retd) Jeremy T. Green OBE, Regimental Secretary, RHQ RMP at the Defence School of Policing and Guarding (DSPG) introduces us to the famous Map Room at Southwick House. Interviewed by Emma, Editor of Come Step Back in Time. Uploaded to You Tube 4.6.2014. ©Come Step Back In Time. On the first floor were the offices of General Field Marshal Montgomery (1887-1976), Captain Moore (Admiral Ramsay’s Secretary), Admiral Ramsay, General Eisenhower, Admiral Sir Maurice James Mansergh (1896-1966), Commander Powell, Staff Officers, Plans/Operations and Wren Baker. At its height, across all of the advanced command posts, of which Southwick was one, SHAEF consisted of six thousand staff and seven hundred and fifty officers. ©Come Step Back In Time. Portrait of Admiral Sir Bertram Ramsay. Southwick House (Southwick Park), Fareham, Hampshire. Defence School of Policing and Guarding (DSPG). Another Wren, Jeanne Law, worked on Admiral Ramsay’s staff at Southwick having previously worked for him at ANCXF HQ, Norfolk House, London before moving with his elite team down to Hampshire on 26th April, 1944. When war began, Jeanne went to work at the Postal and Telegraph Centreship in London, censoring mail from Canadian Soldiers. She eventually became a Wren ‘White Paper Candidate’ which, after passing WRNS Board, meant she was put on a three month accelerated pathway to becoming a Wren Officer. After an initial period of training, she became a qualified WRNS writer. We were shown into a room up on the naval floor, which was the third floor, and there were several officers there and there was one Wren Officer, who did the interviewing. We sat opposite her and I noticed that on the wall hanging behind her, there was a map of Normandy and on her desk she had closed the filed which was in front of her, which I read upside down, which said ‘Landing Craft’. So I realised what we were doing there then. Jeanne recalls being told by Admiral George Creasy (1895-1972) that whilst they were stationed at Southwick, not to walk in groups of more than two or three in case the enemy became suspicious of a large gathering. Staff at Southwick were not allowed to keep private diaries, take photographs or make personal telephone calls to the outside. So as not to alert local tradespeople that a large influx of staff had congregated at Southwick, additional food rations had not been ordered. Jeanne remembers living off of bread, margarine and peanut butter for quite some time after arriving. In one day she consumed eleven slices! There are very few photographs/illustrations of Southwick Park in operation from 1944, save for a few official group photographs of the Commanders and other selected military personnel who worked alongside. There is a picture of the Map Room at Southwick painted in June, 1944 by Official War Artist Barnett Freedman (1901-1958). This painting is a rare and fascinating glimpse of the staff who worked in the room during D-Day. The whole operation at Southwick was conducted at the highest level of secrecy, staff had to sign an additional Official Secrets Act called BIGOT. This was codename for a security level beyond Top Secret. Our quarters were in a brick bungalow type building to the South West of the main house. We slept in the usual double berthed bunks with an ‘Ablution Block’ of lavatories and wash-basins attached to the building. There was an air-raid shelter nearby…Our steel cabinets and office equipment which we had packed-up ourselves after normal duty before leaving London [Norfolk House], arrived with us and was placed in Nissen Huts erected alongside the main house on the north eastern side on part of the driveway. Next to us was the Meteorological Hut with the “Weather Men”. The rest of the operational staff were in offices in Southwick House itself. Montgomery was in his caravan in the woods behind us. Tedder [Arthur – 1890-1967] was somewhere else, I don’t know where he was, but he used to arrive in a white sports car, I was rather impressed. Well the Admiral and his staff and I think most of the officers were in Southwick House itself and we were working in a Nissen hut. [Eisenhower] was quite shy really and he said, ‘good morning’ and he fled up the stairs, three at a time, a very fit man. We did see him quite often. On the day before D-Day, when they had just made their decision, we had been to get our pay, which was fifteen shillings and a soap coupon, and we were walking back when I heard the guard come to attention, and I said, ‘something’s happening let’s wait a minute’, and out of the door came Eisenhower and Ramsay and Tedder and Lee Mallory, and they saw us gorping at them, and Eisenhower gave us the thumbs up sign and we knew it was on. Very early on the morning of D-Day, we hardly slept, and one of the girls in our room was a plotter and she came back just after midnight and she said, ‘I have plotted the first ship’. I recall after the invasion we were allowed into Portsmouth and we borrowed awful old bicycles and I remember I used to bicycle into Fareham to have dinner. All troops and Army personnel were fully briefed by SHAEF four days prior to D-Day. All units were instructed to be sealed-off completely from the public and guarded by barbed wire as well as the military police. Only senior Officers knew the exact locations for invasion in Normandy. In order to ensure secrecy was maintained right up until the point of embarkation, troops were just briefed on the manoeuvres and told false locations. It was also at this briefing that the men were given their invasion currency and printed beach instructions. ©Come Step Back In Time. General Eisenhower, signed photograph that hangs on the wall of the the Eisenhower Room at Southwick House. Defence School of Policing and Guarding (DSPG). ©Come Step Back In Time. View from the French windows of General Eisenhower’s former study which he used in 1944. Fort Southwick can be seen in the distance on Portsdown Hill. In 1944 the view was out onto a densely wooded area but this was deforested in the 1970s. Defence School of Policing and Guarding (DSPG). Following D-Day, staff at Southwick found themselves with quite a bit of free-time. However, in the immediate aftermath of June 6th, were far too exhausted to take advantage of movement restrictions being lifted. Many staff fell asleep at their desks having worked for days on end with little or no sleep. Jean remembers witnessing colleagues sleeping in the grounds, on the lawn or outside their Nissen Huts. Jeanne also recalls that the staff were given a bit of leave after D-Day and when she returned she discovered that Admiral Creasy had been taken off in an ambulance with exhaustion. After a period of recuperation, staff did begin to explore their location. Wrens could often be seen cycling into Southwick village, sailing on the lake, going to the cinema in Portsmouth or picnicking on Hayling Island. Southwick’s Golden Lion pub was a favourite haunt of SHAEF HQ’s servicemen and women. The front bar was known as the ‘Blue Room’ and officially adopted as the Officers’ Mess. ‘Ready for The Day’ (1944). Showing preparations across Southern England in readiness for D-Day. Published by British Pathe on You Tube 13.4.2014. In early 1944, Prime Minster Sir Winston Churchill (1874-1965), General Dwight D. Eisenhower (1890-1969) and US President Franklin D. Roosevelt (1882-1945) all met to discuss in detail the plans for D-Day. General Eisenhower had arrived in Britain earlier in the same year, on the 15th January. ‘Ike Visits Monty’ (1944). Published by British Pathe on You Tube 13.4.2014. It was essential that a dress rehearsal took place approximately one month before the main event. This operation was codenamed FABIUS. A full-scale exercise which took place at the end of April, beginning of May. The aim was to test all aspects of the land, sea and air forces ability to implement both Overlord and NEPTUNE (codename for naval plans). Hampshire played a vital role in Operation Fabius. British and Canadian assault forces departed from Southampton and Portsmouth to mount a mock invasion on Littlehampton, Bracklesham Bay (Forces S and J) and Hampshire’s Hayling Island (Force G). American units (Forces O and U) attacked Slapton Sands in Devon, in several phases, as part of the ill-fated Exercise Tiger in which many men died when German E-Boats sank two tank landing crafts (LCTs) and damaged a third. Estimates for the number of men dead or missing at Slapton Sands, range from seven hundred and forty-nine to nearly a thousand. A final death toll has never been given for several reasons including the fact that the whole tragic incident was shrouded in secrecy for years afterwards. Surviving servicemen who took part in Exercise Tiger were threatened with Court Martial if they discussed what happened on that fateful Friday, 28th April. If events had become public knowledge then morale amongst servicemen would have been severely compromised at such a crucial stage during the preparations for D-Day. In addition to the various military components and logistics, the contribution made towards D-Day preparations by the Home Front, not just in Hampshire but right across Britain and America, should not be underestimated. In order to equip an Allied force of this magnitude a comprehensive production programme had to be put in place. Conscription for women was brought into force in Britain. In order to be exempted from conscription, a woman had to now prove that her husband’s war work or her children would be adversely affected by her absence. It was no longer possible to give domestic responsibilities as a reason for exemption. Fuel was rationed and raw materials amassed on an unprecedented scale. Aluminium saucepans were collected for smelting down into aircraft components and iron railings were removed from outside public buildings and private residences. Evidence of ‘stubs’ left following the mass removal of railings can still in many towns, villages and cities today. From April, 1944, onwards, American, British and Canadian military personnel poured into Hampshire along with army contingents from Poland, Czechoslovakia, France, Norway, the Netherlands, Belgium, Greece, Australia, Rhodesia, South Africa and New Zealand. Troops were recalled from theatres of war in North Africa, Sicily and Italy. By D-Day, over one and a half million American troops alone had arrived in Britain armed with their rifles, nylons and Hershey bars much to the sheer joy of local young ladies as well as small children. At Southampton’s Royal Pier Pavilion, American GIs were a familiar sight and at the Guildhall, Glenn Miller and his Orchestra played several dates to keep the troops entertained whilst waiting upon final orders for D-Day to come through. American Army’s field kitchens provided their troops with a constant supply of apple pie, clam chowder and hamburgers, a familiar sight particularly at encampments on Southampton Common and in the New Forest. For local people who had been used to a diet controlled by rationing, this must have been quite an enviable spectacle. Hoards of trucks, tanks and jeeps could be seen parked-up on Hampshire roadsides particularly in the southern half of the county. Bridges had to be strengthened and roads widened to accommodate heavy-duty traffic. Fields were soon full of army supplies and munitions. Sleepy rural idylls were turned into giant army encampments and country lanes became military car parks. Red-bricked estate boundary walls were covered in white-painted numerals to indicate where tanks and jeeps should be parked. Local pubs were filled with military personnel and it wasn’t unusual for families to adopt the tank parked outside their house. Troops enjoyed good local hospitality many being invited indoors to join the family at mealtimes. Kitchen tables were often used by Officers to spread their maps out on. Soldiers could be seen sleeping in hedgerows, on the roadside or by their vehicles. Following their initial arrival in Hampshire, troops would bide their time playing cards, writing letters and sharing friendly exchanges with the locals. Many other troops lived in temporary camps, mostly in wooded areas such as the New Forest or Forest of Bere. Both of these locations were close to embarkation points. Men stationed in camps had reasonable facilities including showers, film-screenings areas and basic outdoor facilities to play sports such as softball, football, volleyball and table tennis. Southampton’s main parks and the Common became densely populated military camps and later marshalling areas prior to embarkation. The atmosphere, full of heightened expectation, must have been palpable. ©Come Step Back In Time. Canadian WW2 War Memorial, near Bolderwood, New Forest, Hampshire. Canadian soldiers stationed in a remote part of the New Forest before D-Day, would gather for regular church services at a site were there is now a permanent memorial to the fallen. 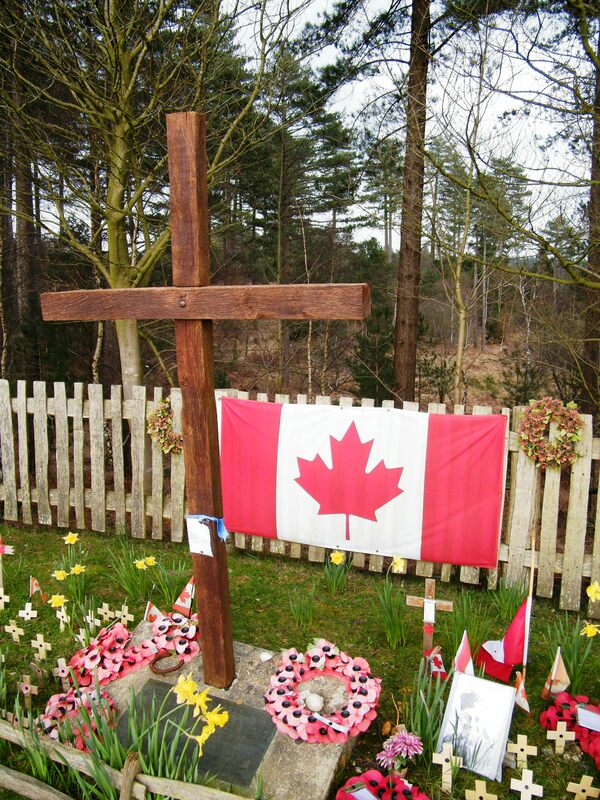 Men of the 3rd Canadian Division RCASC (the Royal Canadian Army Service Corps) erected a cross on 14th April, 1944 were they all gathered for worship. The cross can still be seen today. Men of the 3rd Canadian Division and 2nd Armoured Brigade landed on Juno Beach, June 6th, 1944, suffering fourteen fatal casualties on that day. There were further losses in the weeks and months that followed. On Friday, 2nd June, 1944, Winston Churchill arrived at a tiny railway station in the Hampshire hamlet of Droxford, not far from Southwick. Churchill was accompanied by members of the War Cabinet and overseas leaders (Charles de Gaulle, President William Lyon McKenzie King and Jan Smuts). Operation Overlord’s Commanders, based at Southwick, met with these political giants for one last conference before final orders to proceed were issued. Droxford was chosen for two reasons. Firstly, it was close to Southwick and secondly, the station was near to a railway tunnel, should there be an air raid, the train could back into the tunnel and obtain safe shelter. The overseas leaders also visited troop encampments and inspected vessels anchored on the Solent. Accompanying this illustrious team were a number of smartly dressed secretaries and personal aides. Everyone lived on the train from Friday 2nd until Sunday 4th June. A local farmer, living opposite the station, delivered fresh milk every morning and was escorted along the track to the train by an armed guard. In the months prior to D-Day, airstrips across Hampshire witnessed an increase in traffic. Sites at Needs Ore Point, Beaulieu, Holmsley South, Ibsley, Lymington and Stoney Cross became fully operational. Portsmouth-based aircraft manufacturer, Airspeed Limited, built the famous Horsa gliders. These gliders were unique in that they had a higher percentage of timber used in their construction than traditional military aeroplanes. Both the control column and wheel on a Horsa were made of wood. During the D-Day, sixty-eight Horsa gliders, carrying men of the 6th Airborne Division, along with four giant Hamilcars loaded with heavy equipment, headed for their landing zone. Forty-seven Horsas and two Hamilcars reached their destination. As daylight took hold, another two hundred and fifty gliders, most of which were Horsas, delivered seven thousand five hundred men directly into the battle zone. On 31st May, 1944, troops were moved from their temporary encampments to begin boarding their landing crafts and ships. Communications and general entente cordiale with the locals was forbidden from this point onward. Along the South Coast there were a total of twenty-four embarkation points all with troop marshalling areas close by. There were four embarkation points in Portsmouth and three in Gosport. The Eastern Docks of Southampton were used for docking the larger ships and the Western Docks sheltered landing crafts. Southampton Town Quay had three separate embarkation points for troops boarding landing crafts. Both the Isle of Wight and Hythe Ferry Terminals, as well as the Ocean Cruise Terminals, were used to full capacity. Civilians living close to ports did not have the same degree of interaction with troops, following their initial arrival in the county, as they did in rural communities. On 31st March, 1944, a Regulated Area (No. 2) Order was issued whereby a ten mile wide coastal strip of land from the wash to Lands End meant that the movement of civilians was restricted, closed in fact to all visitors. In the city of Southampton, no-one was allowed to enter or leave the city without a permit. The only exception was for residents living on the Isle of Wight. A subsequent Direction (no.26) was issued on 19th April, 1944 and remained in force until 14th June, 1944. Southampton Docks were covered in camouflage and smoke screens which was meant to ensure that dockside activity was obscured from enemy reconnaissance. However, there are reports of local citizens travelling on the top of double-decker buses in the city who were able to see soldiers making their tanks waterproof. On the night of 5th June, local people were woken by the sound of thousands of aircraft flying overhead. The invasion of Normandy had begun. When civilians awoke on the morning of 6th June all military vehicles and personnel had vanished overnight. However, on 13th June, 1944, D-Day+7, Hitler attempted to have the last word when he ordered the launch of the first V1 flying bombs (Doodlebugs), London being the first target. Several days later, on 15th June, two hundred and forty-four V1’s were fired at the capital and fifty at Southampton. One month later on the 15th July, 1944, a V1 fell on Newcomen Road, Portsmouth, killing fifteen and injuring eighty-two. Col(Retd) Jeremy J. Green OBE, Regimental Secretary RHQ RMP (at Defence School of Policing and Guarding (DSPG)) explains in detail the significance of the weather and D-Day. Interview by Emma, Editor of Come Step Back in Time. Uploaded to You Tube 2.6.2014. In the above Podcast, Emma, Editor of Come Step Back in Time uses Stagg’s diary entries to piece together the facts behind the decision by Eisenhower to delay invasion by twenty-four hours based upon Stagg and his team’s detailed weather forecasts in June, 1944. I(a) For such a complex operation as a landing on a heavily fortified coast, it is not an easy matter to determine one set of meteorological conditions which would be ideal from the points of view of all arms concerned. The ideal conditions would change with each stage of operation; in the hours immediately preceding and following the actual hour of first landing, the conditions would vary almost from hour to hour. Probably the only firm prerequisite is the restriction on the strength (and in part on the direction) of the surface wind with its immediate effect on the waves and surf on the landing beaches. Hence, from the viewpoint of naval operations alone, the ideal conditions would be little or no wind within the actual sphere of operations and no swell-producing wind for the whole period covering the time of sailing of the assault forces to their landings on the beaches. Visibility, as affected vertically by cloud and horizontally on the surface by fog, mist/haze, is one of the most important factors for the Air and Naval aspects of the operation. There are other factors; for example, the condition of the ground in the operational area as regards softness (mudiness) for the movement of heavy vehicles both tracked and untracked. This factor is taken into account in the planning stages but in certain circumstances may also be important in deciding the day of assault. (i) Surface winds should not exceed Force 3 (8-12 mph) on shore or Force 4 (13-18 mph) off-shore in the assault area during the days D to D plus 2. Winds might be Force 5 in the open sea but only for limited periods. (ii) In the days preceding D-Day, there should be no prolonged periods of high winds of such direction and in such Atlantic areas as to produce any substantial swell in the Channel. (iii) Visibility, not less than 3 miles. a) Cloud ceiling at least 2,500 feet along the route to and over the target area. b) Visibility at least 3 miles. a) Not more than 5/10 cloud cover below 5,000 feet and cloud ceiling not lower than 11,000 feet over the target area. a) Cloud ceiling not less than 4,500 feet, visibility not less than 3 miles over the target area. a) Cloud base not less than 1,000 feet. a) Cloud not below 1,000 feet and visibility not below a mile except for heavy bombers for which there is the additional stipulation that low cloud tops must be less than 5,000 feet high and there should be only fragmentary middle cloud. a) For paratroops, the surface wind over the target area should not exceed 20 mph in the target area and should not be gusty; and for gliders the surface wind should not be over 30-35 mph. b) The intensity of the ground illumination should be less than half moon at 30 degrees altitude or the equivalent in diffuse twilight. The ground should be sufficiently dry to allow movement of heavy vehicles off made-up roads. June 6th, 1944, 0100 – Wind W. Force 3 Cloud 7/10-10/10 3,000-5,000 ft; 0400 – Wind WNW Force 3, cloud 4/10-6/10, 3,000ft, 05.45 – Beachhead clear with 6/10 low, cloud inland, 0800 – Wind WNW Force 3-4, cloud 7/10-9/10. Late afternoon clouds broke and cleared over the Channel. 1700 – Wind WNW Force 4 (Force 5 at times) cloud clear over Channel but 6/10-9/10 over beachhead and further inland. Clear area over the Seine estuary (N. value for airborne, glider flight). 1800 – Cloud, Cherbourg 4/10-6/10, 3,000-5,000 ft, Havre 1/10-2/10, 2,000-3,000 ft. Thought to be one of the greatest feats of engineering in the twentieth century, the Mulberry and Gooseberry harbours were a crucial part of Operation Overlord and Neptune. These pre-fabricated harbours provided shelter and enabled troop reinforcements, as well as all of their equipment, to be landed in France following the initial invasion of the Normandy beaches. These artificial harbours, both the size of Dover, were operational from D-Day+10 until, and after, Cherbourg was liberated. They were made to last for ninety days. There were two Mulberry harbours, Mulberry A and Mulberry B, one at Arromanches for the British forces and another at Utah beach, for the Americans. Unfortunately, Mulberry A was put out of use on D-Day+15 (21st June) following several days of severe storms in Normandy. No. 7 Dry Dock, Southampton. The steel Bombardons were constructed here. 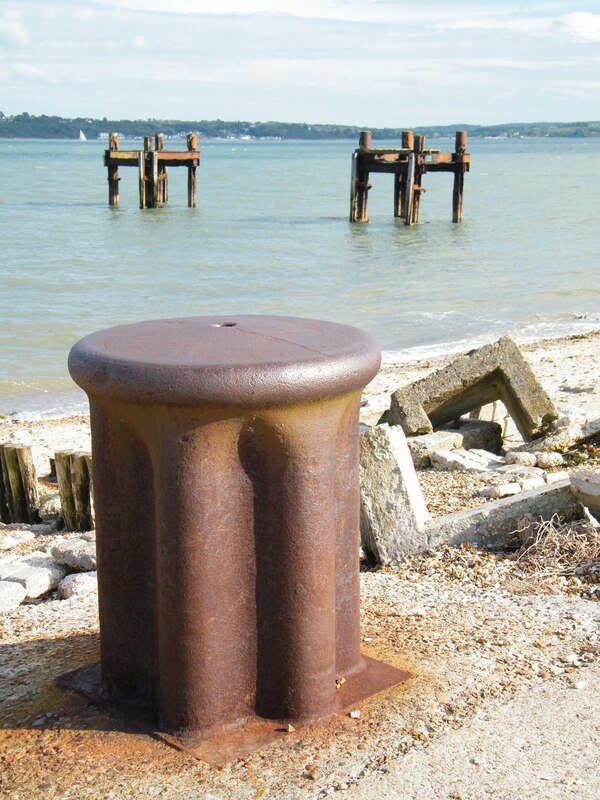 reinforced concrete caissons (PHEONIXES) – these were sunk in situ to support the pierheads and floating roadways. They provided the main breakwater or harbour wall and two hundred and thirteen of them were built. 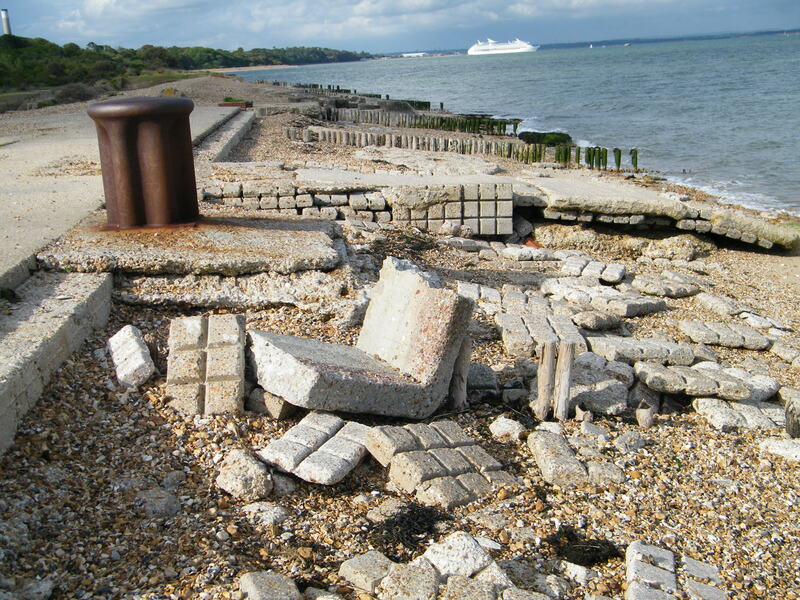 Lepe (Stone Point), near Exbury, Hampshire was both a construction site and embarkation point for six thousand troops on D-Day itself. The site was established within a very short space of time. Wilson Lovatt & Son were the firm chosen to manage this site with technical assistance provided by Messrs Holloway Brothers (London) Limited. 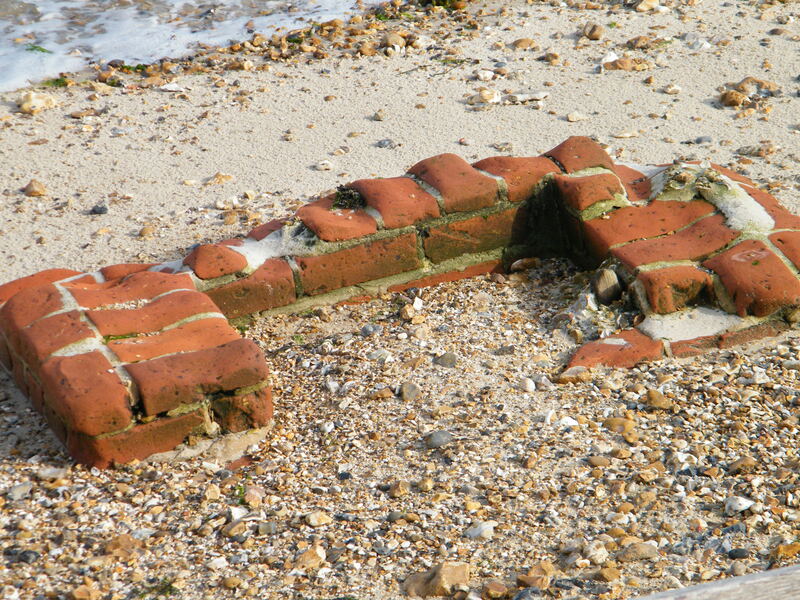 Seven hundred men worked on construction of the Mulberry Harbours at Lepe. Letters have survived (Cadland Estate archives) that show some of the labourers were caught stealing chickens, poaching and vandalising a bathing hut on the nearby Cadland House estate. ©Come Step Back In Time. 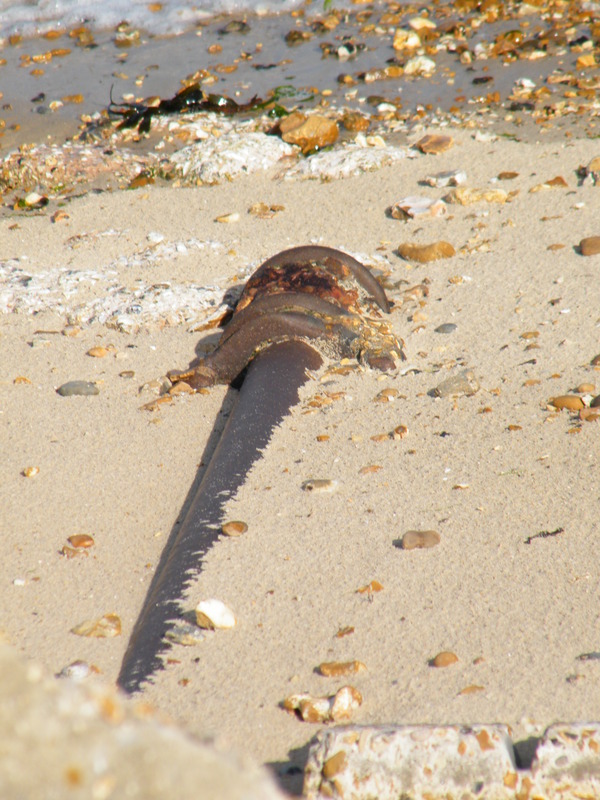 Lepe (Stone Point), Hampshire was also the site where PLUTO (Pipeline Under The Ocean also known as Pipeline Underwater Transport of Oil) began. Work on Pluto started in August, 1943. The Shell-Mex/BP oil storage plant at Hamble was selected as the supply base for the project. Seventy miles of flexible pipe was wound onto vast drums known as Conums and then towed by two powerful tugs. The submarine pipelines pumped oil directly from the south coast to the shores of Europe and at one point reached Germany. The planning team for Pluto was based at H.M.S. Abatos which was actually the requisitioned bombed remains of the former Supermarine Spitfire Factory. 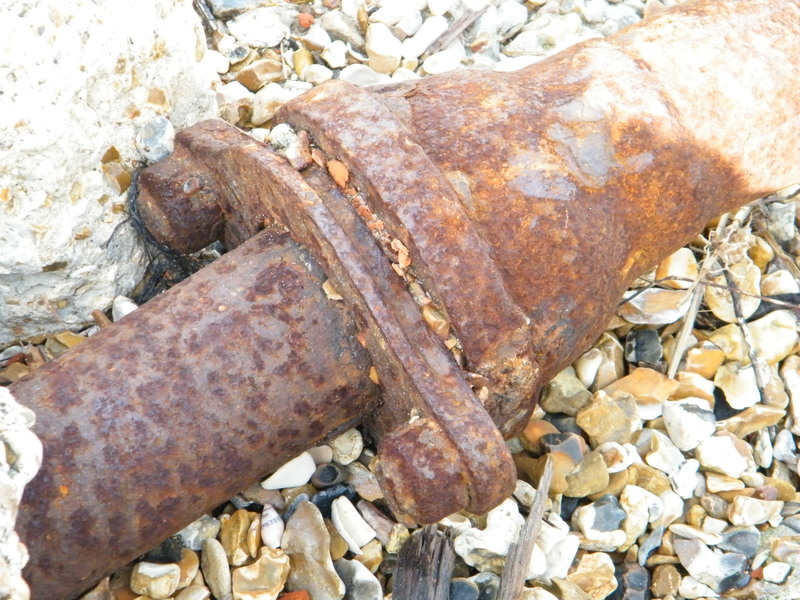 Pumping stations were built at Sandown on the Isle of Wight which fed Cherbourg (four pipes) and Dungeness, Kent which fed Boulogne (sixteen pipes). 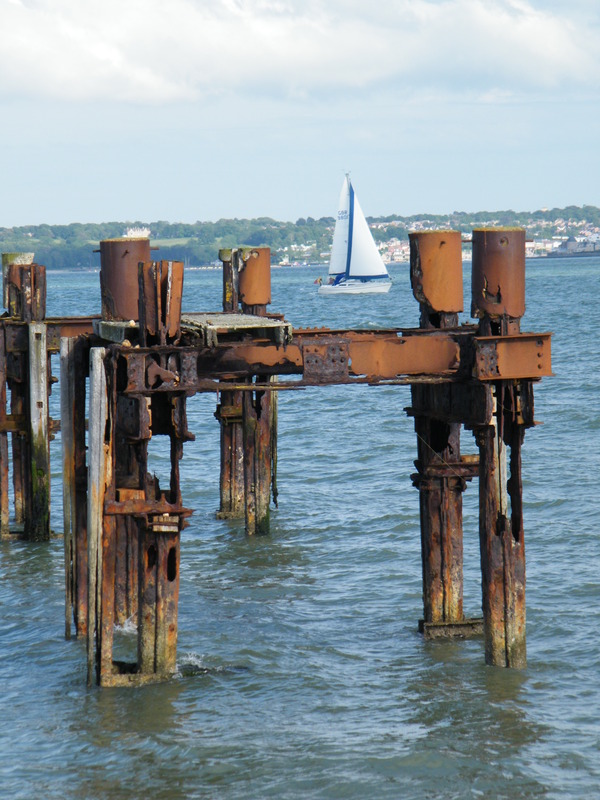 Two bollards on the hardstanding were used to secure vessels during the loading. 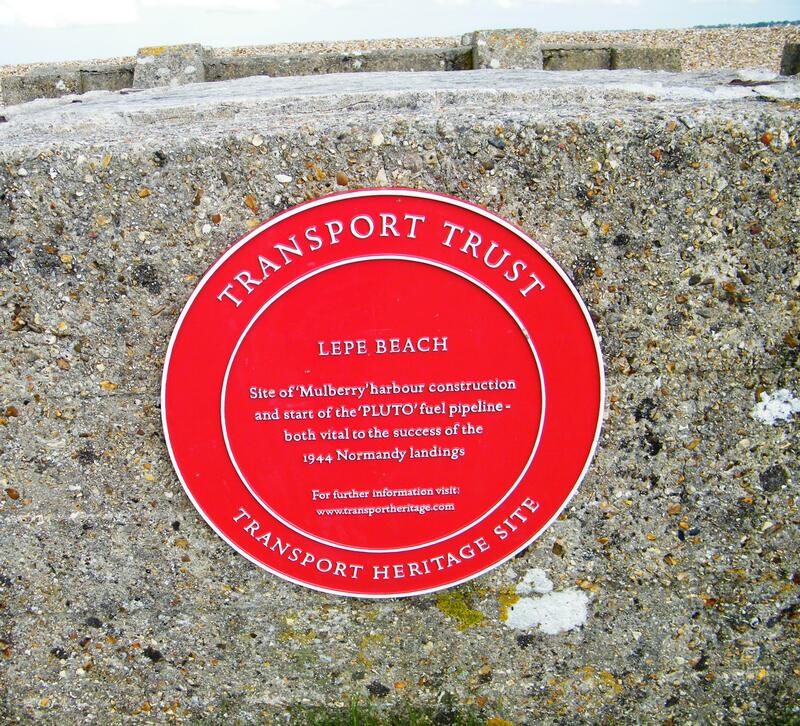 Editor of Come Step Back in Time discussing the importance of the Mulberry Harbours and explores the site at Lepe (Stone Point), near Exbury. In the background behind Emma, you can see the two ‘Dolphin’ iron structures. 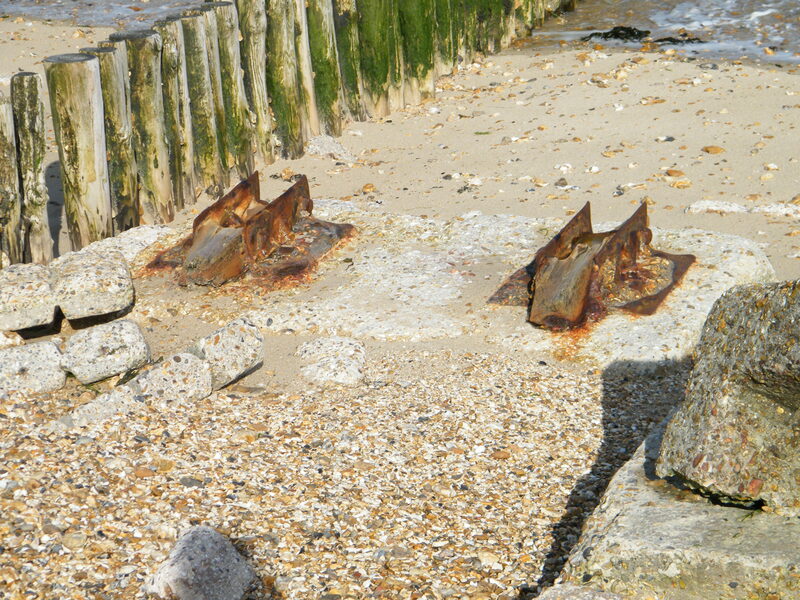 These are the remains of jetties used to load vessels. D-Day Beach Landing (1944). Original footage showing British troops landing in Normandy. British Pathe War Archives. Uploaded to You Tube 21.12.11. This is the opportunity which we have long-awaited and which must be seized and pursued with relentless determination. Let no one underestimate the magnitude of the task. I count on every man to do his utmost to ensure the success of the great enterprise which is the climax of the European War. To all soldiers, sailors and airmen of the Allied Expeditionary Force. You are about to embark upon the Great Crusade, toward which we have striven these many months. The eyes of the world are upon you. In company with our brave Allies and brothers-in-arms on other Fronts, you will bring about the destruction of the German war machine, the elimination of Nazi tyranny over the oppressed Peoples of Europe and security for ourselves in a free world. The free men of the world are marching together for victory. There were five assault beaches involved in the Normandy landings. Utah, Omaha (American) and Gold, Juno and Sword (British and Canadian). Juno beach was original to be called ‘Jelly’ but it was thought inappropriate to send any man to die on a beach called ‘Jelly’. Conditions aboard LCTs were appalling. A heavy weather swell on the ten-mile Channel crossing to Normandy resulted in men suffering from dreadful seasickness. The anti-sickness tablets issued were not really that effective. Cold, wet, tired, dizzy with nausea and weighed down with heavy kit, men descended into four feet deep water. In several oral history testimonies by D-Day veterans, men describe being hit by an overwhelming stench of cordite, fuel fumes and smoke upon embarkation in Normandy. Many state the moment you stepped off of the landing craft into the water, it was a fight for your life, the hardest ten yards you will ever have to travel. Survivors were also left with terrible deafness from the continuous artillery bombardments. On landing, each man was handed two anti-seasickness tablets, a small collapsible cooker with methylated spirit blocks and forty-eight hours worth of dehydrated food…As each LCT was fully loaded it took up its position in the armada and then as D-Day was postponed for twenty-four hours we rode-out the storm off of the Isle of Wight. The two tablets did not work. Naval personnel were shouting ‘Get ashore’… over the ship’s side, still dizzy from seasickness, and into water 4ft deep, each one let out a gasp as the water swirled around, and we struggled for sure. It was the hardest ten yards I ever did, but we all got ashore. Being only 5ft 7, I was in water up to my chest…I stepped into a crater and went under. My buddy next to me grabbed my pack straps and just dragged me along until my feet found bottom again…I was carrying 40lbs of special equipment that would have kept me anchored to the bottom.. Hitting the beach was an experience I would never want to repeat. I was just nineteen years old, very scared and seasick again. My only clear thought was to get on solid land as quick as possible. Instead of our regular packs we had been issued assault jackets, a sort of vest-like garment…In the various pockets we stored K-rations, a quarter pound of dynamite with fuses, hand grenades, smoke grenades, medical kit (a syringe, morphine)…We had two slings of ammo belts slung across our shoulders. On our backs we carried an entrenching tool, a bayonet and poncho…As assistant to the flame thrower, I carried his rifle and pack…Altogether, our equipment weighed about 70lbs. On approaching the beach there was a craft going in right alongside of us, LCVPs (Landing Craft, Vehicle and Personnel) which is a smaller craft which holds thirty troops, and some them hit floating landmines and so forth, and you know, they exploded and you would see a guy flying through the air with his rifle and everything, but there’s nothing you can do about that. You can’t stop and help those people. By midnight on the 6th June, all initial assault forces, with the exception of those on OMAHA beach, had gained a majority of their objectives. One hundred and thirty thousand men had landed from the sea and twenty-three thousand troops had landed from the air. Eleven thousand Allied troops were either killed, injured or missing. The Allies met with mixed resistance from the Germans but the 21st Panzer Division did manage to initially keep hold of Caen and its neighbouring airfields. On D-Day and during the Battle for Normandy, more than forty thousand Allied soldiers and over two hundred thousand Axis soldiers died. Poem that was reprinted in the ‘Southwick Siren’, news journal of CHQ, Fort Southwick. This is from the D-Day issued of that journal. The donor, Sub Lieutenant Derek Watson RNVR, served on Admiral Sir Bertram Ramsay’s staff in the Plotting Room at Fort Southwick. He was on duty on D-Day, from 0800 hours to lunchtime. This item is from the D-Day Museum Archives. Index Key PORMG 1994.41. Normandy veteran and life-long Portsmouth resident John Jenkins, who served in the Pioneer Corps, recalls his experiences of D-Day. Filmed at the D-Day Museum, Portsmouth. Uploaded to You Tube by the D-Day Museum 4.2.2014. ©Come Step Back In Time. Field Marshal Bernard Law Montgomery, statue opposite the D-Day Museum, Portsmouth, Hampshire. Podcast – Stagg’s Diaries and Reports. Copies of weather forecasts for Operation Neptune and Overlord, including the diary of Group Captain J. M. Stagg, RAF, and his report are available to view at the D-Day Museum Archive. Index Key: PORMG: 1990.745. Originals are held in The National Archives (AIR 37.1124A). D-Day Museum Archive. Numerous documents consulted. Most of the extracts used in the above article include an Index Key reference as part of their citation. If you wish to consult a particular oral history I have mentioned, it would be helpful to the Archive if you could include the Index Key when making your enquiry. Portsmouth History Centre, Portsmouth Central Library. I would like to thank the extremely helpful and knowledgeable staff who work at the Portsmouth History Centre. The Centre is an excellent resource for local history of both the Portsmouth area and also Southern Hampshire. For access details and opening times please, Click Here. Please note that you will be required to bring with you Photo ID as well as something with your name and address on, such as a utility bill. You can also use the collection if you have a CARN card. What a wealth of information. I have these details of my father’s recordin your museum. Do you have any more information about him, please? Dear Rosalie, thanks so much for your lovely and interesting comments about my D-Day article. Unfortunately, I do not have any information about Louis Marie but may I suggest that you contact Andrew Whitmarsh, who is the D-Day Museum’s Development Officer, he may be able to help you further with your enquiry. His email address is: Andrew.whitmarsh@portsmouthcc.gov.uk – many kind regards Emma. Text Copyright © 2016. All Rights Reserved · Come Step Back In Time. All Images (unless otherwise stated) Copyright © 2016. All Rights Reserved · Come Step Back In Time.